When I reverse the brood boxes, usually some time in April, I don’t just pull the hive apart and reverse the positions of the deeps. (That’s an easy way to squish the queen, by the way.) I set up an empty deep next to the hive and, if it’s warm enough, carefully inspect each frame before I move it into the new bottom deep. No heavy lifting required. But more importantly, this allows me to assess the strength of the colony going into the new season and make adjustments on the spot if necessary. I will add drawn comb to the brood nest if the cluster looks like it needs room. I will add frames of honey or pollen if the bees are starving for it. I will give them frames of brood from another colony if they’re weak. In short, I will take whatever action is required to get the bees started on the right path for the new season. Then for the rest of the year, because I know exactly what condition the colony was in at the beginning of the year, I’ll be able to assess the strength of the colony without having to dig into the bottom deep and disturb the brood nest every time I do an inspection. Are the bees filling frames in the top box with pollen? Is the brood nest straddling the deeps? I can tell a lot from looking down into a hive where the brood nest has been working its way up from the bottom. It’s more difficult when the brood nest has been working it’s way from the top down. It’s more work, at least for me it is. I usually end up having to lift the top deep, essentially separating it from the bottom half of the hive, and potentially splitting up the brood nest, so I can see what’s going on in the bottom, to see how much the cluster has moved down and so on. In my book, that’s too much work and too disruptive. It’s much easier and less disruptive to the brood nest — if it’s seated in the bottom deep — to pull out a few frames in the top deep and look down to figure out what’s going on — and I never have to lift a deep or potentially split the brood nest if its straddling the deeps. That’s why I reverse the brood boxes on most of my hives sometime in April. It doesn’t necessarily reduce the chances of a swarm, but it gives me an excuse to carefully inspect and assess the strength of the colony and perform future inspections with greater ease and less disruption to the brood nest. I could be singing a different tune by this time next year, or even this time next week, but for now, this is where my experience with reversing the brood boxes has led me. How to checkerboard a hive. Reversing brood boxes: when and why. This entry was posted in Brood Frames, Brood Nest / Cluster, Drawn Comb, Drone Brood, Inspections, Month of April, Reversing Hives, Swarm Prevention, Year 2014 and tagged Practical Tips. Bookmark the permalink. I got an email from a first-year beekeeper today asking if she should reverse the brood boxes of her hive before winter. Assuming she’s working with the standard configuration of a Langstroth hive (two deep supers for the brood chamber), I said no, that I have no idea why anyone would reverse the brood boxes before winter. The bees usually cluster close to the bottom of the hive as the weather turns cold in the fall. They gradually move up to the top of the hive throughout the winter as they eat through their winter stores of honey. Some beekeepers reverse the brood boxes (the deep supers) in the spring in an effort prevent swarming. 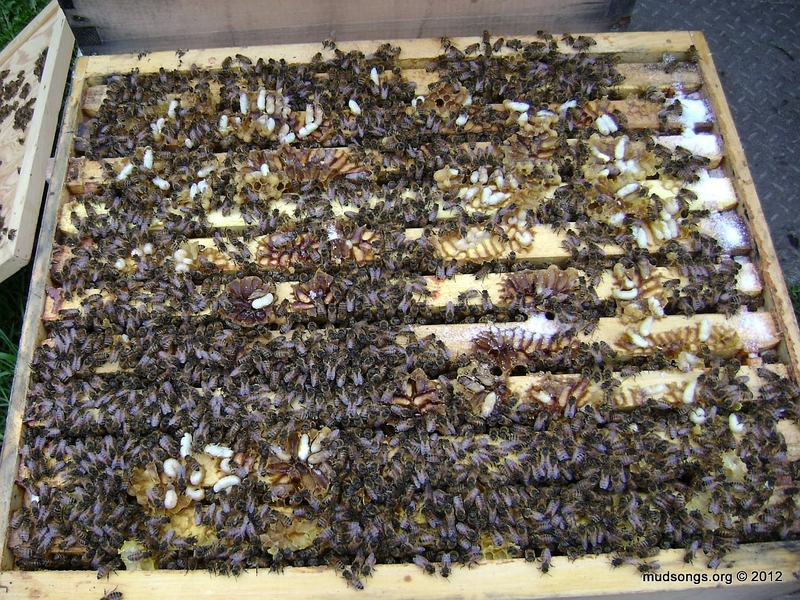 That means the top deep, containing the brood nest that has worked its way into the top of the hive over the winter, is moved to the bottom of the hive, and the deep that used to be on the bottom, and is now empty of bees and honey, is placed on top, above the brood nest. The empty comb in the new top deep above the brood nest supposedly, in theory, more or less, or so we’re told, frees up space for the queen to lay and thus reduces the likelihood of swarming. But that ain’t necessarily so. Just because the bees spend the winter moving to the top of the hive doesn’t mean they don’t have enough sense in the spring to move back to the bottom where there’s plenty of room for the queen to lay and for the workers to start making honey. That’s what natural colonies living in a hollow tree do. That’s what colonies living in Warré hives usually do. And I’ve heard from numerous beekeepers who say colonies living in Langstroth hives are no different and that reversing the brood boxes in the spring does little to prevent swarming. I can’t argue with that because in the three years that I’ve been reversing my brood boxes, I’ve had exactly 50% of those colonies swarm on me. Most of my swarms have occurred for one reason: Neglect. That and my own idealism. I don’t buy into the “let the bees be bees” mantra, but I probably still hold on to a few idealistic notions when the cold hard facts would serve me much better. (I doubt I’m the first beekeeper to be defeated by their idealism. Nothing is more idealized than beekeeping.) Ideally, I don’t like to disturb the brood nest if I don’t have to. But I’ve learned through experience that the bees prepare for swarming in my area around the month of May, give or take a week or two — and THAT is when I shouldn’t hesitate to disturb the brood nest if I have to. That’s when I should check for swarm cells. That’s when I might try some checkerboarding. That’s when I should add empty comb to the brood nest to give the queen immediate space for laying, or empty frames to give the worker bees something else to do other than prepare for swarming. With the right timing, it’s not too difficult to reduce the chances of swarming. But I’m not sure reversing the brood chamber is the answer. But when the brood nest has been working it’s way from the top down, it’s harder. It’s more work, at least for me it is. I usually end up having to lift up the top deep, essentially separating it from the bottom half of the hive, and potentially splitting up the brood nest, so I can see what’s going on in the bottom, to see how much the cluster has moved down and so on. In my book, that’s too much work and too disruptive. It’s much easier and less disruptive to the brood nest — if it’s seated in the bottom deep — to pull out a few frames in the top deep and look down to figure out what’s going on.